The Rais Mino II is a small, efficient and sophisticated stove with a glass door that offers a fascinating view of the fire and its flames. Rais Mino features firewood storage and baking bay. 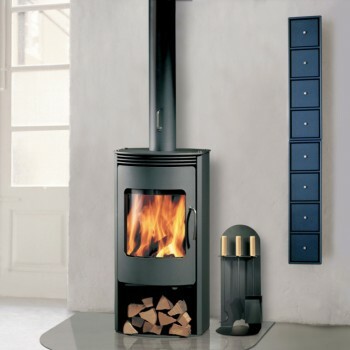 The rounded front and straight sides allow this stove to be used practically anywhere. Petite in size, the Rais Mino II is ideal for small spaces, such as a bedroom, kitchen or home office. The Outside Air System exclusive to Rais ensures the correct distribution of incoming primary and secondary air for optimal combustion, providing excellent heat regardless of the size of the Rais Mino II. This stove comes standard with a functional soapstone baking compartment, elegant heat-retaining soapstone top an sides, and a steel door. Like all Rais stoves the Rais Mino II is equipped with a patented air-cooled stainless steel handle to keep hands burn-free.